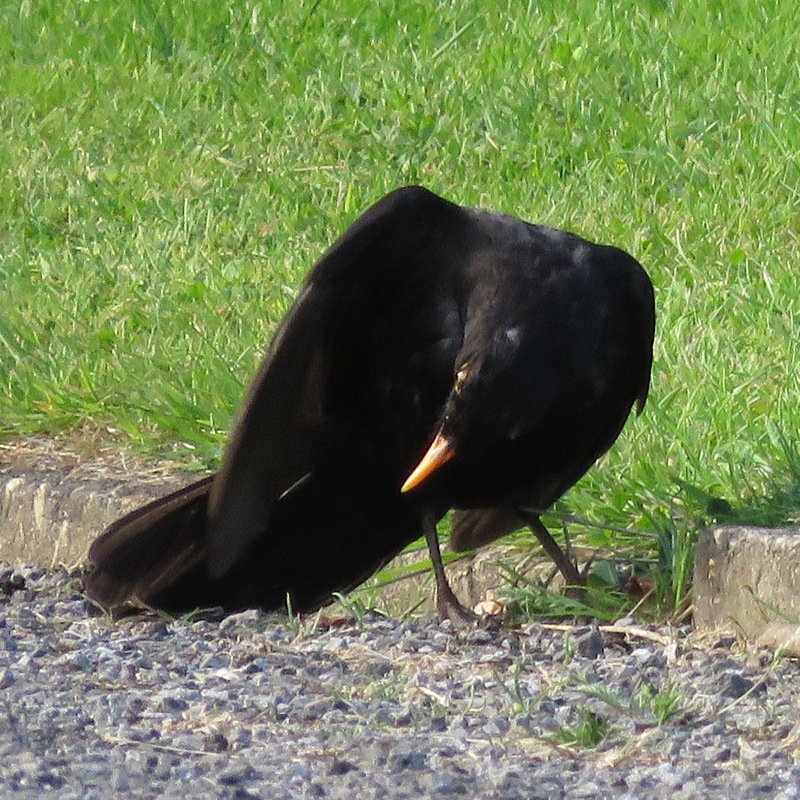 This morning, on my way to work, I noticed a Blackbird behaving strangely by a kerb. When I looked closer I realised that it was 'anting', a behaviour involving the use use of ants by birds. The Blackbird had its tail and wings spread, squatting - probably on top of an ants nest - and the ants were climbing on the birds feathers. The blackbird was rubbing its wings, coming back to the same spot. An ant run by the back of its head and the blackbird wiped it off. You can watch a short clip of the behaviour. Anting is thought to aid in cleaning or disinfecting the bird's plumage. The bird would be using the ants as tools, as ant's secretions, including formic acid have known bactericidal, insecticidal and fungicidal properties. The ants would behave agressively and defensively if they are picked up or rubbed by the bird or if the bird is disturbing their nest. Blackbirds, other thrushes, starlings and corvids use anting. Some of the species sit on wood ants nests, or even apply individual ants on their plumage. Some bird species use a similar behaviour with millipedes, which also produce strong chemical secretions. I think it is unlikely anting is a learned behaviour, as it is quite rare. I wonder if the ant's frenzied activity around nests today - it was flying ant day in Hull - stimulated the Blackbird to engage in anting behaviour. Very interesting video. I've never seen a bird anting. Incidentally, down in London we had our flying ant day in June, presumably because the south, and particularly London, are warmer. HI Ralph, thank you . A new one for me too, but I did see a crow doing it a few weeks back (I was driving and on a red traffic light though!). Yes, for us this was the first flying ant day of the year. You teach me so much about birds, for which I thank you. I have not noticed this activity but it does make sense.